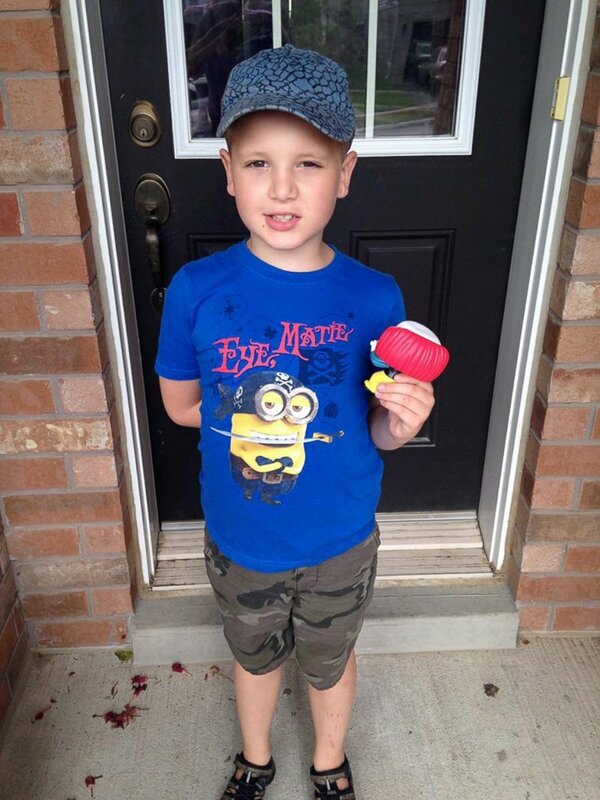 BRANTFORD, Ontario -- A Canadian mom was moved to tears after her son brought home a birthday party invitation accompanied by a touching letter penned by a class mom, whom she'd never met. "It was an ugly cry for me that day," Tricia Klein of Brantford, Ontario, told ABC News. "Yes, I was shocked that someone would take not only the time to write the note, but to be considerate enough to include him with all of his difficulties. It was a wonderful moment." Klein, 34, a mom of three, said her youngest son Timothy, 7, was diagnosed with non-verbal autism when he was 2 years old. "While it allowed us to access services, the diagnosis was pure devastation," she said. "I went through a long period of grieving...this was not the son I expected to have, or the life I expected us to live. Of course you love your children no matter what, I'm not saying that has ever, or will ever change regardless of what comes our way. At the time I felt robbed, robbed of the toddler years, the milestones of typical childhood and future years to come." Despite facing many "scary" challenges, Klein said Timothy is doing much better. Tricia Klein a mom of three, said her youngest son Timothy, 7, was diagnosed with non-verbal autism when he was 2 years old. "Timothy is a very happy and social little guy," she said. "He struggles with social interaction, but longs to be a part of groups and activities and have friends like every other kid his age. He loves to play soccer...watch YouTube videos and swim." But because Timothy has difficulty being among crowds and gets "overstimulated easily," Klein said she'd often decline birthday party invites from his classmates. "When he gets anxious, he focuses on doors--repeatedly opens and closes them...for hours, if you would let him," Klein said. "It's tough because he really does crave social interaction and being included. He also has many food aversions and difficulty with sensory input. I would hate for Timothy to have these difficulties and take the spotlight from the birthday child." "Carter sat beside Timothy at school and he always talks about him. I really hope he can come. We are renting a bounce castle that we can attach a small bounce slide at the bottom. We will also have water balloons and water guns. Maybe Timothy can come earlier in the day if it would too much with the whole class. Let me know so we can make it work." Klein shared the touching letter on her blog, The Book of Timothy, last summer but her post started recirculating on social media this week. "We parents of the 'specials' know only too well the hurts our kids feel when they are left out of the social gatherings relative to childhood," Klein wrote on her blog. "Organized sports, play dates, sleep overs and yes- the dreaded birthday parties. "I can say whole-heartedly that my son has not attended a single one," she added. "We have received countless invitations in the few years Timothy has attended school; of kids who mercilessly invite the entire class - and for that I'm grateful (don't get me wrong). Really cool sounding parties too. I wonder if the parents know what would happen if I brought Timothy? The interruptions...the meltdowns...how I would hate to take the spotlight from the birthday child. So we politely decline. Every. Single. One...Until this one arrived." 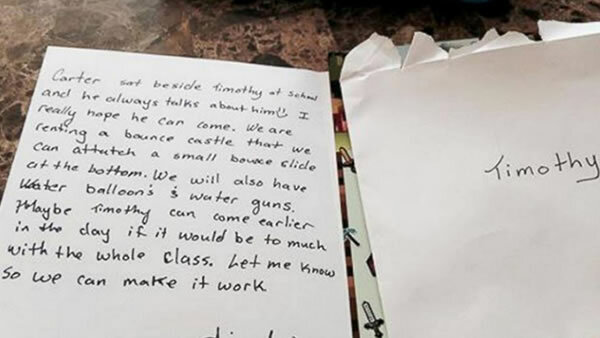 Ainsley Peikos, also of Brantford, Ontario, said she wrote the note to Klein because Timothy had become friends with her son Carter, who wanted Timothy to attend his 7th birthday celebration. "Carter had always talked about him, so I didn't think twice when he wanted him at the party," Peikos told ABC News. "The only question was, 'How could we make it work so that Timothy could come and have a great time just like anyone else?' He came early. He went right into the bounce castle with Carter and they had a great time. Klein agreed that Timothy had fun at Carter's birthday party. As for her blog post gaining new life, Klein said she hopes it spreads a special message. "I want only one thing for our kids--for all kids really, and that is inclusion," she said. "All they want is to feel included and accepted for who and what they are--that different is okay...it's just different."